I hadn't forgotten about the book, I just hadn't gotten around to it. (Obviously it's been awhile since I couldn't find the original reviewer.) Then a friend of mine was talking about a book she had just bought that she was sure I would enjoy because it had to do with a photographer. She offered to let me borrow it. Bingo! I started it yesterday evening and finished it after the little guy hit the sack tonight. I didn't pay attention to who the author was when I dove into the book. I assumed it was a female writer and this was some kind of Christian romance novel. (If you know me and know my dislike of Christian - or otherwise - romance novels then, well, . . . I was reading it on the recommendation of a GOOD friend whose reading preferences mirror my own quite frequently.) Our main character, Mick, begins this book as a construction worker and I have to confess that I was a bit taken aback that a female author would know so much about the construction industry. I was delighted thinking that this book had to have been thought out and researched a bit. A bit further into the book I laid it down and glanced at the back cover to see a picture of a male author. Oh. That doesn't really effect my review of the book, it was just a funny realization. "He was out cutting grass when Layne heard the lawnmower running and decided it would be a good time to have a chat. It had always seemed to Mick that she preferred to talk to him when the vacuum cleaner was running or she was at the other end of the house. They would sit in the same room for two hours while she read a book and he watched a ball game, with neither of them saying a word. But then she'd lay her book down, get up, go all the way back to the bedroom and start talking to him in a normal tone of voice. A minute later, she'd come back down to the den and ask why he didn't answer her. She told people he was hard of hearing. (page 279)"
I laughed through the entire paragraph and then read the excerpt aloud to my husband who also found it amusing. Not that we identified with it or anything. The main message of this book is that we are all created masterpieces. God made us for a purpose and a plan. Perhaps the road He takes us down doesn't feel like a cruise ship tour to the Bahamas. Instead we're bumbling about on rough terrain, barely able to take the next step. But God does have a plan for each one of our lives. "Pound this into your head -- nothing comes alive without contrast. (page 161)"
That is so true. Nothing comes alive within us until the light of God breaks into the darkness, casting out shadows and/or illuminating the scene. Nothing is quite so exciting as seeing God take a life that is dull and empty and bringing out color and contrast - making our life pictures "pop." A "charmed life" isn't necessarily an enviable one. It takes struggle and hardship, darkness and horror, to make what is good and enviable become so. It is in and through pain that we are afforded the opportunity to grow. Satan's darkness overcome by light produces the most beautiful and interesting pictures you could possibly imagine or fathom. We ARE individual masterpieces, full of beauty. I really enjoyed this book. There were no jarring passages or loose ends to wrap up. Everything ended as it should but not without Mick's share of heartache and pain. There are relational conflicts and growth that occurs that we see in every day life. 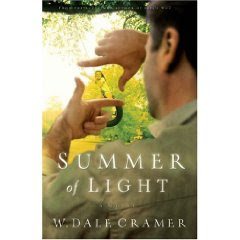 I would love to read some more of Cramer's work and I'm glad to know there is more out there. This is an excellent message told in an insightful way that can only serve to delight and inspire the reader. Fun. And challenging. A perfect combination for a pleasant read. Cool. It sounds like an awesome book. I really appreciated that line about contrast too. It's so very, very true. I think I might have been the original reviewer on this one - I loved it and I'm pretty sure I linked to my review on Semicolon. I'm glad you enjoyed it as much as I did! I especially liked the unlikely friendship between Mick and Aubrey. If you're looking for more of Cramer's work, Levi's Will is also excellent. Sounds interesting. I'm definitely adding it to my list! I also dislike romance novels of any kind. This sounds like a very sweet book though. I read it but never did get around to reviewing it. I liked it, too, but not as much as I did Cramer's other books, Levi's Will and Bad Ground. Here's my review of Levi's Will, if you're interested. I have read and loved Cramer's "Levi's Will."